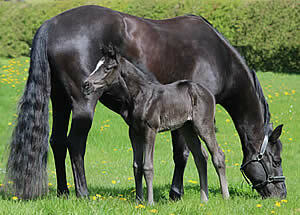 Some foals are just born with that extra bit of sparkle and this filly is one of them! She is athletic, always uphill in her movement and reminds me a lot of her big sister St Pr St Larkshill Scandalous! This is second generation breeding for us and so this filly is extra special. She has a beautiful head and expression. She is already showing a mega canter and tremendous suppleness through her body. We are thrilled with this latest edition to Pr St Larkshill Supremacy's dynasty and even more thrilled to own her in partnership with my niece Charlotte Drakeley! Dream Boy is the first Vivaldi son to be approved by the KWPN. He is a modern, long-legged stallion, particularly good as a dressage horse model and has a lot of charisma. His impressive hind leg action characterizes all three gaits. The canter was inherited from his grandfather and in the performance test, was assessed with an 8.5. All three gaits and his exemplary work ethic were rewarded with good scores. Performance - In his PAVO Cup qualifiers, Dream Boy won two out of the four legs, and came fourth in the final. In the GMB Stallion competition he placed second in the final, and received a score of 9.5 for his trot, his canter, and his talent. In the World Young Horse Championships in Verden, Dream Boy was 14th in 2013 before excelling to take the bronze medal for six-year-old horses in 2014, having won the first round. In 2016, Hans Peter Minderhoud took over the ride, and together they won the Dutch Small Tour Championships in 2016. On taking over the ride, Hans Peter said: "He is a very talented horse, likes to work and has such a positive character. He has everything a Grand Prix horse needs." Sire - Vivaldi, Dream Boy's sire, was very successful at the small tour level under Han Peter Minderhoud and has an excellent reputation as dressage performer. He was reserve champion of his stallion performance test and in 2007 he won the Pavo-Cup of five-year-old dressage horses with Hans Peter Minderhoud. In 2008 and 2009, he added triumphs in the KNHS/KWPN stallion series achieving marks of 10.0 for his trot. At the World Championships in Verden in 2015, his son Eye Catcher won the bronze medal of the six-year-olds. In 2015 and 2016, his son Fenix won the five and six-year-old Pavo-Cup in the Netherlands. The Pavo-Cup of six-year-olds was a real festival for Vivaldi in 2016, when behind Fenix, in second and third place, were First Apple and Fantastique, both Vivaldi progeny. Damline - Resia is an elite mare, did a good performance test and comes from a family that produced many good dressage horses. She has also produced Wanted, who is also competing at PSG, and the licensed stallion Gladstone is also descended from this mareline. Progeny - Dream Boy's foals inherit his good looks and movement - they are light on the ground and of a super modern type. The KWPN recommends that Dream Boy improves the conformation and canter. He already has several licensed sons, and his oldest crop will be turning five-year-old in 2017; they are to be watched with interest.